I thought I was finished with Journey. I was wrong. Originally released in 2012, ThatGameCompany’s beloved PS3 sand-surfing simulator has been re-released this week on the PlayStation 4. I reviewed it back when it came out, which feels like it was a lifetime ago. Since then, I’ve seen critical acclaim, backlash, and back-backlash. I’ve seen its creators give talks and win awards. I kept playing the game. From 2012 to 2013, I played Journey all the way through at least a half-dozen times. Yesterday I downloaded it to my PS4. I figured it’d be worth having Journey installed on my current Sony console, given that my PS3 is now unplugged and sitting in a corner. It’s free for me, since I already own it on PS3. It doesn’t take up that much hard drive space. Whatever, might as well download it. “I wonder how it runs on PS4,” I thought, firing it up. I played through that familiar intro, watched as my little red pilgrim climbed the sand dune and beheld The Mountain. “It looks really pretty,” I thought. A little prettier than before, and smoother, but more or less how I remembered it. Then I caught a glimpse of another player. It was just for a moment, right at the end of that first area. For some reason it gave me a jolt; I hadn’t quite considered how this game is “new” again, how it was just released on a new console. Of course there are lots of people playing Journey on PS4 right now. Of course another player is going to turn up in my game. As I entered the second area, that second player was right by my side. They stuck with me through the entire first half, in fact. They weren’t a newbie, either—this person knew the location of every one of the scarf-extending collectible glyphs and helped me get to a few that I’d never found back when I played on PS3. 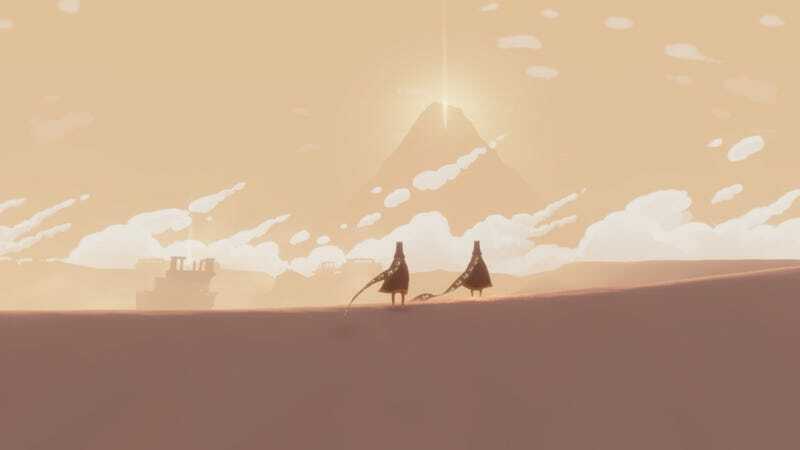 I had forgotten the extent to which Journey’s seamless, silent multiplayer defines the game and the extent to which it compels you to continue playing. I had only intended to play for a few minutes, but I found I couldn’t stop. How could I leave my traveling companion in the lurch? We’d already done and seen so much together. I was surprised to find a new interpretation just yesterday, years after my most recent playthrough. When I met my traveling companion, I noticed that their scarf was longer than mine. They’d collected a few more glyphs in the opening areas. They could jump higher than I could, fly a little longer. Each time we stopped to take in the view, I found myself staring at their scarf. Did they notice, too? Did they look at my shorter scarf with pity? I struggled in places to keep up, and I started to feel jealous. They’d started out with a lead on me, and no matter how much they helped me grow my own scarf, theirs was always longer. Why was I feeling this way? Why couldn’t I stop fixating on it? Was it me? Had I changed since I last played? We reached the dangerous underground area, where, if you’re not careful, a great floating leviathan will chase your little red character. One of those creatures spotted my traveling companion, and I watched in horror as the beast creamed them and left them lying, wounded, on the ground. They got to their feet and I saw their scarf had been irrevocably damaged. It was now shorter than mine. I guiltily thought of my previous jealousy; I’d forgotten that this could happen! I had resented my friend for having more than I did, while forgetting that even in this game, outside forces can be an equalizer. Just because you have a long scarf now doesn’t mean that will always be the case, or that you won’t need to lean on those you’ve supported in the past. When Journey first came out, I wrote a post advising people to try playing it solo, at least for their first time through. When I had reviewed it, I’d played through the game before anyone else had it, so my first journey had been solitary. Now that I’ve played the game a lot more, I don’t entirely agree with what I wrote back then. It is interesting to experience Journey solo, and I still think it’s worth doing, at least once. But for me, this game has become inextricably tied to the shared experience. Journey is more than simply a “modern classic,” and more than yet another last-gen remaster to be downloaded for posterity. It is a living creation with a still-beating heart, and as relevant a work as ever.